Are you hesitant to get rid of things because they hold memories for you? It is about becoming conscious of what, how and why you own the things you do. Becoming conscious of the impact they have on your happiness or feeling of balance. You know, we often don’t need much in order to hold on to the memory. To illustrate, I have a piece of tree bark in my small sentimental box. It has a little bit of dried up moss on it. When I go into that box and see it, I remember my trip to Oregon to visit a friend and just about every moment spent in the red wood forests there, plus a lot more. Oh, I have more from that trip than just that tree bark. I have a ton of pictures. I never think about those memories until I go into that box, see that bark, or look at my pictures. In truth, aside from the pictures, I have seven memory holders from that trip. I have one tree bark, one piece of weathered wood 6 x 1 in round, and 5 stones. The first two are purposeful memory triggers. When I hold that piece of wood and close my eyes I am virtually transported to Mt. Shasta. I can see every detail of the mountain and the paths that I walked on. I can remember everything. The stones on the other hand are not that purposeful. I picked them up from different places that we visited thinking that they would help me remember the spots we visited. That was really an unconscious secondary justification. I just love stones. Over time I have forgotten which stone came from which place (I didn’t write on them). I think because they were all stones and not different types of objects. Time blended the memories together. When I see those 5 stones they remind me of exactly the same memories that the other two items do. And, if I were to mix them with the other stones I own, they would loose their memory significance all together. I would no longer be able to distinguish them as coming from that trip. In truth, I cannot say I need to keep these 5 stones because they remind me of something that I won’t remember without them. I just have them because I love stones. It is always fine for anyone to choose to keep something that they love except when keeping it will make them unhappy in any way. I have hundreds of small stones, most of them I have put in garden pots, or in a bowl on my dining table. Iam just saying, they aren’t cluttering up surfaces in my home or blocking my hallway, or causing my closets and drawers to be non-functional. The things we have that we love should be honored and appreciated. 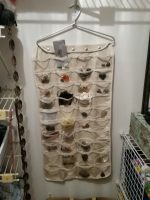 For instance, I have little precious stones and crystals housed in the jewelry hanger in my closet(see the picture). Notice how they are displayed in my closet. I often admire them because I put the jewelry that I wear daily in that hanger. So, I am reminded to admire my more precious little stones every time I put my rings and necklace on. I don’t have any other stones in any storage place out of sight. If I think about storing something out of sight unseen, unappreciated perhaps for years or never to be seen again until I die, the I don’t need it. If it is truly not a memory holder or would crowd my storage space so that the space isn’t functional, I don’t need it. I can take a picture and pass it on to someone who can add value to it. With rocks, I just throw them into the woods somewhere! This video is a really good one on this topic. They talk about added value achieved in letting go. Another point they bring up is about people not releasing things just in case they may someday need it. I agree that sometimes this is really true because of limited resources and ability to earn. But, so many of us hold on to so much “just in case” when resources are not a problem and the “holding on to” is causing distress and disharmony. In some way causing chaos. Its just good to ponder for a moment if keeping it is worth the dysfunction or disharmony it causes in your space. If there is none then for sure, I would decide to keep it! It’s a Ted Talk by The Minimalists. I love these guys, while realizing that not everyone is going to be a minimalist like them they do inspire us all to think about the belongings we own and I just love sharing their stuff. Loved it, I’m drowning in stuff! Going to follow the videos and books, hopefully it will help me…Thank you!